Friday Find: A Giant Donut! This week we found a giant preserved DONUT! You may be wondering, why would you preserve a donut and what does have to do with architectural preservation? Well, this isn’t any normal donut but one made of fiberglass and steel. The giant donut was originally placed atop the Long Beach, CA coffee shop, The Grind located at 5560 E. Seventh St. in the 1950’s to attract motorists passing. Long Beach has long been known for its distinctive retro character. Items such as the famous roadside icon are what make the city unique. 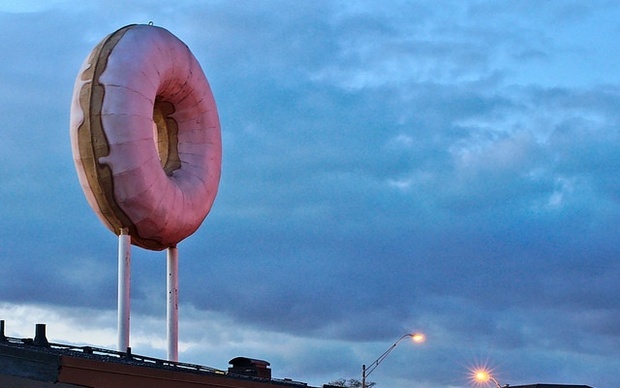 When the new franchise Dunkin Donuts took over the building talk of getting rid of the icon started, leading to a local community members and preservationists to start the campaign “Save the Giant Donut”. 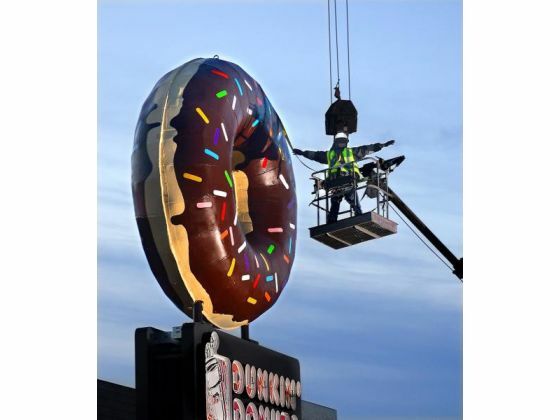 On Monday, December 8 the restored donut was placed atop Dunkin Donuts in preparation for the business’s official opening the following day. The campaign was successful in saving the donut but it was restored with a few changes. The originially famous pink donut has been changed to a chocolate glazed sprinkle donut. The donut may be an eyesore to some but to preservationists it represented part of the cities historic retro character. This is a great example of why preservation is important and shows how architecture can play a much larger significance than appears to the eye. Dunkin Donuts, which originated as an east coast franchise is now rapidly expanding on the west coast. The video below discusses this and even highlights the “Save the Giant Donut Campaign.” Click HERE for more information and to view the campaign’s Facebook Page.